Play the Ace is a vibrant new voice calling out for attention in the male-dominated music scene of pop punk. 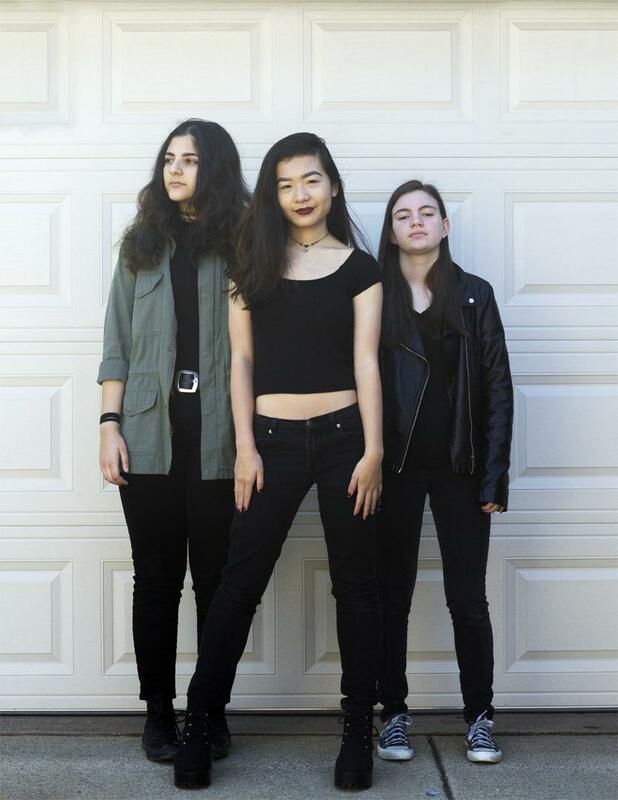 Comprised of three femmes - Iris Chang (guitar/vocals), Dena Asaad (drums), and Molly Lammes (bass) - Play the Ace is bringing some much needed diversity to “the scene”. Rare Candy got the chance to chat with the trio over the phone about recording their first EP and their favorite Star Wars movies. Rare Candy: How did you get your start? How did Play the Ace come to be? Did any of you take formal lessons? Iris Chang: It started off as me and Dena at first because we didn’t have that much to do. We had way too much free time and we were really good friends because we liked the same music. She played drums, and I played guitar so she was like, “Hey! Why don’t you come over and we can jam out and stuff.” Eventually it snowballed and we got more and more serious about it. Molly Lammes: When they decided they wanted a bass player and I was like I need people to hang out with. I got a bass so I could hang out with them more. Dena Asaad: Yeah, Molly didn’t even own a bass before the band. ML: That’s what I spent my Easter money on. DA: If you want to hang with us, buy a bass. In terms of musical background, I bought my drum set when I was ten and I taught myself how to play. In middle school I played French horn. I hated it so much. I tried quitting multiple times and my teacher wouldn’t let me. I wanted to be in marching band and that never happened. Eventually, I quit but I still play drums and ukulele. ML: I play saxophone and currently play for my school band. I had lessons for saxophone but taught myself how to play bass. Saxophone is a treble clef instrument and bass is a bass clef instrument and I still can’t read bass clef, I can only read tabs, but it’s okay. IC: I started playing piano when I was five and I had actual lessons for that until I was thirteen. I started playing guitar at eleven or twelve. I took a few months of actual lessons for guitar, but I didn’t feel like they helped me much. Piano lessons had already set the foundation I needed in terms of reading music and music theory. I did lessons for maybe half a year and then just kept teaching myself guitar from then on. RC: What is the scene like in Texas? I’d imagine there’s a lot of country, bluegrass, and folk coming out of the Texas scene. But it also seems like there’s a thriving pop-punk scene, with bands like Waterparks rolling out of Texas. DA: I think where we live specifically there’s not a huge scene, but we have friends that play the same music as us and we’ll play shows together. In Dallas, which is near where we live, there’s a large scene. IC: It’s like a niche. Overall it’s predominantly country and folk music, but there is a good two-ish blocks where the rock scene is. It definitely has its place and it’s been growing, but it’s still relatively small. It definitely feels more like a tight-knit community. DA: Austin also has a lot of pop-punk influence as well. RC: Why do you love pop-punk? Why did you choose to go into this scene of music? DA: For me, I was kind of raised on pop-punk. I have two older brothers and when I was like seven, my eldest brother would be like, “Listen to Green Day! My Chemical Romance! Blink-182! Those are your only options!” So it definitely feels like I was raised on it, and I got more into it as the years passed. It was always there for me when I needed it and I never felt alone. IC: My parents listened to that kind of music, but not that often. I didn’t really get into it when I was little, for me it was more around middle school. I went through a lot of internal struggles, and it was just the type of music that I related to and it felt like the artists understood what I was going through. IC: I had to tell her they had broken up. DA: In middle school, Iris and I were in the same friend group but we weren’t that close. We went to the mall with a friend of ours and then that friend left, so it was just me and Iris and we ended up sitting alone in the food court and I was like, “Do you know A Day To Remember?” I forced her to watch this one music video. IC: And that’s how we became friends. RC: I feel like the pop-punk phase always starts in middle school or early high school. If you could collab with anyone in the pop-punk scene who would it be and why? DA: At the moment I’d have to say, Broadside, Waterparks, and With Confidence. They’re my current trinity of pop-punk. ML: I’m struggling. I honestly just really want to meet Mark Hoppus. DA: I was hesitant to get into them because they felt very techno. RC: Pop-punk has been heavily male-dominated for most of its existence. However, things are starting to change and there are more minorities and femmes in “the scene” as well as plenty of allyship from predominantly white and male bands. What do you think the future of pop-punk could be like? You have a lot of potential to start change the scene as three femmes in the industry. DA: I feel like we’re really diverse. None of us are of the same race or religion and we’re all female in a predominantly male industry. I feel like many things in history started as white and male. It’s time for a switch in the pop-punk era and I feel like it is happening. There are a lot more bands that are female-fronted, or all women, or more diverse and not just all white males. I think that’s great for pop-punk, because for so long pop-punk had the same sound and now that there’s a new wave bringing something fresh and new, it’s kind of reviving pop-punk. So many people will say, “pop-punk is dead.” No. It’s not. There’s a diverse, refreshing new wave and new sounds. IC: I think pop-punk’s future is really female. We just played a show and three out of the four bands were all female, and the fourth was female fronted. Being on the ground and seeing it, there are so many femme bands and so many girls wanting to be in bands. In the future I think we’re going to be seeing more women in music. ML: I feel like the most pop-punk thing you can do would be to go against what beliefs are commonly held and I feel like that’s what we’re trying to do. RC: How do you think members of “the scene” can be more supportive of one another? Iris – you’re part of the “Girls in the Scene” Facebook Group (started by singer-songwriter Maggie Schneider). IC: We’ve gotten so many opportunities from that Facebook group. Outside of groups like that, people need to be mindful of the kinds of people that they’re working with. I see a lot of shows where promoters, consciously or not, will just happen to book only predominantly white and male bands. They don’t take the initiative to find artists that don’t necessarily fit the cookie-cutter of what pop-punk looks like. I think people just need to be mindful of their work. There are so many female bands out there, and there aren’t quite as many in the scene. We don’t have equal representation. When you think of pop punk, most of the bands that come to mind don’t have any women in them. People need to start giving women a platform, and things will start growing because more girls will want to start bands and be able to see themselves in the industry. ML: Going back to the show we played with an all female lineup, I had heard of most of those bands before but I had never gone to any of their shows because I hadn’t seen promotion for it. One of the best sets I’ve ever seen was Sweet Chaos and they’re just two girls – one on bass and one on drums. They were incredible. IC: I put that show together, actually. I didn’t start off thinking that I wanted to put together an all-female show. First, I booked Not Ur Girlfrenz– and they’re insanely talented, they’re all in middle school – and then from there I booked Sweet Chaos. Once I had those two booked I decided to make it a show to support women in the industry. Even though the ratio of girls in bands is a lot smaller, it wasn’t difficult to find these bands. The excuse of, “oh, well there aren’t that many female-fronted bands out there” is untrue because it was so easy to get in touch with each of these acts, and that’s just three bands. There are so many more possibilities. RC: Most often the default for women in pop-punk is just Paramore. IC: The amount of Paramore comparisons we get is outrageous. It’s like people can’t think of any other female-fronted bands. RC: What about PVRIS or Tonight Alive? IC: When it comes to super successful and popular pop-punk bands there just aren’t that many women. RC: Where did you get the inspiration for the title of your EP, All My Friends Are Ghosts? IC: It was actually a super last minute decision. The original title was Buzzkill and we even had CDs with the title on them. ML: We had to go through and Wite-out the names. IC: It was after writing “All Is Well”, which was the last song we wrote for the EP. DA: We wrote it the week before we recorded. IC: The line “all my friends are ghosts and I’m stuck in this hole alone”—I felt like it really resonated with the entire story of the EP. DA: It is also a very quintessential pop-punk name. Ghosts are a very prominent thing in pop-punk. IC: Before our release I looked at Spotify and at the time there were no other songs called “All My Friends Are Ghosts” and then after we dropped the EP there were like five different songs with the same title. DA: I think ghosts are cool. RC: The album art has a little bit of a Donnie Darko vibe… How did the album art come together? How do you think visual art intersects with music and performing arts? ML: Our CDs had the bunnies on it. DA: What is it with bunnies in pop-punk? Blink-182... I bought cheap bunny ears and I got my friend to come over and I had her just put this bed sheet over her head, had her war the bunny ears, and sat her in front of the chalk wall in my room. I took the photo and sent it over to Iris to edit. In terms of visuals and music, I love that kind of thing. With this EP I really wanted to represent the record with the cover art and have them relate instead of just a picture of us looking edgy. I wanted something that would give the listener an idea of what the EP was about without even listening to it. It’s on the borderline of dark and happy – bunnies are more happy, ghosts are dark and represent death – so with All My Friends Are Ghosts there’s a contrast. IC: I’ve been drawing practically since I came out of the womb. I consider myself an artist before a musician. When we get the opportunity to do something with visual art, I love it because it’s a chance to tie things together, and I think it really helps elevate a project. Everything is about image now, and I think it really helps give us that extra push forward and really stand out. ML: Iris controls our Instagram and everything looks great, and I’m not very artistic so I get the Snapchat. RC: Your debut EP, All My Friends Are Ghosts has been out for a year. How has your band grown since then? What has this year been like? IC: It’s been crazy. Before we released the EP we did a lot of covers, and did the “100 Days of Music Challenge” so we put a cover up every day for one hundred days. We had a lot of content showing what we were about, but not really who we were. That was a question we got asked a lot, we had fans and industry people alike looking for something to show them who we are as a band, instead of playing other people’s music. It was cool because people could see us and our feelings. We were definitely able to do more in general after. DA: We grew a lot as musicians and as people. If you listen to it, we sound so angsty and emo and we’re just sad sophomores. Some songs we wrote our freshman year and the approach was definitely, “let’s be really loud and make a lot of big noises to let out our frustrations”. Now, I feel like we’re more reserved and have gotten more mature with our sound. I think our next record will show that growth and All My Friends Are Ghosts has some of our base elements but we’ll definitely sound more mature. ML: We got together after we put out the EP and we already wanted to clean things up a bit. Before we were very distortion happy and now we just want to grow. DA: Our music taste has grown too. I listen to a lot of pop-punk still but I also listen to a lot of indie. I feel like our other musical tastes will influence our next record. RC: Everyone has to start with a super angsty pop-punk EP. IC: ...With a lot of crying and screaming. DA: And with no breaks. RC: Where do you want your music to take you? IC: Our general goal is to just keep going, we don’t really have any set plan like “in two years this is where we’re going to be and this is what we’re going to do”. If we see opportunities, we take them, and we’re constantly trying to do whatever we can. ML: We’re definitely just trying to see where it takes us. IC: If an opportunity comes up we’re like, “oh that’d be fun” and then we take it and see where it takes us. A few years ago, we never would have expected where we are now. We’ve been doing more interviews and we’ve been playing more shows. Our online presence is taking off and we’re talking to people from all around the world. DA: It would be nice to go on tour, it doesn’t have to be huge, we’d just like to travel somewhere. RC: Are there any specific places or venues you’d like to play? DA: I’d love to play New York. I feel like the New York scene is very hype. IC: We’ve been trying for an East coast tour. You drive a few hours and you’re in the next city or the next state. DA: We love the east coast. RC: You’re all still in high school…has it been difficult to balance school and the music? I’m sure it’s been challenging. IC: For me personally it is kind of hard because there’s so much to do with school, and the band keeps growing, so there’s more you have to be on top of at all times. However, when we get together and play music it also acts as a stress reliever. It’s a little bit of both. ML: And then I’m in marching band so from August to November I have maybe one day off a week. It’s a lot, so I won’t see these two for a while. Someone thought I got kicked out of the band because I didn’t play a show with Dena and Iris because I was at a marching band competition. DA: I’m on the debate team and I’m a photographer for the yearbook, Iris edits for the yearbook, and I run my own club and volunteer for political campaigns. I do a lot outside of the band and it can get frustrating because I won’t be free when Molly and Iris are free, or when Molly isn’t free Iris and I will be free. I’m okay with missing certain things, like I missed a debate competition once for the band. You really have to prioritize with all the activities and school. We’ve gotten used to it and this is our third or fourth year trying this so we know how to manage our schedules and find time to practice. ML: Our first year we were all so frustrated at each other, but now we’re strong enough as a group where I could not see Iris for three months and then see her again and feel like nothing has changed. IC: I think we’ve mastered being able to practice and actually sound good without seeing each other. DA: We’ve been playing the same songs for quite some time. IC: I think our idea of how everything works together, and how we sound together is clearer. We can practice on our own and once we come together it all just works. RC: What do you think is going to happen when you all go to college? IC: Our plan is just to go wherever this takes us, so once we get there we’ll figure it out. Everything is on a “let’s wing it” basis. ML: We are all best friends and we could also try and see each other over breaks. DA: If we get a great opportunity our senior year that we wouldn’t want to miss then yeah, maybe we’d make the choices to be fully for the band. However, we all want different things for our futures outside of the band. Molly is obsessed with space. ML: I want to do aerospace engineering! I love it so much. Our school district actually has an engineering class and I just finished my third year, which was actual aerospace engineering. We used some physics concepts and applied them before formally learning about them. IC: I just really like music and there’s a lot of business that goes behind being in a band that outside people don’t really know about. Having to do this and work with promoters and booking agents and press I’ve discovered that I really like doing the business side of things. My ultimate goal is to tour manage. DA: I want to go to graduate school (Pratt Institute) and study architecture. I love the whole design aspect of things. Part of me also wants to go into law and politics. RC: Your band bio describes your love of bad jokes and Star Wars movies… so do you have a favorite Star Wars movie? DA: It’s very difficult for me to pick a favorite because it’s like having to pick a favorite child, but I’d have to say The Empire Strikes Back because so much happens. I have enough Star Wars shirts to change like twice a day and still have shirts. IC: You could wear them for two weeks straight. Ironically, I’ve never seen Star Wars. DA: I always joke that the two constants in my life are music and Star Wars. ML: I can’t narrow down to one movie, but I like the original trilogy the best. RC: If you ever got featured on Punk Goes Pop, who would you cover and why? IC: Probably some Carly Rae Jepsen. I listen to a lot of pop-punk but I like to sprinkle some bubblegum pop in there. I’ve been really into “Cut to the Feeling” by Carly Rae lately. DA: I listen to a lot of indie music and I love Harry Styles. So… any Harry Styles song. IC: Life is too short to pretend you don’t like Harry Styles. ML: “I Want It That Way” by the Backstreet Boys. RC: What’s next for Play the Ace? DA: We’re going to start writing some more music and hang out, since we’ll all be on summer vacation. IC: Later in the year we’d like to go back into the studio and record another EP, so we really want to take advantage of the fact that we all have time this summer to write. Check out Play the Ace’s official website here . Follow them on Instagram and Twitter and give them a “Like” on Facebook. Listen to All My Friends Are Ghosts here.